Recognizing the importance of creating a pipeline to success for all young girls of color while also exposing them to dynamic women in STEAM fields, the Dallas (TX) Chapter of the Links, Incorporated is honored to establish the Women Who STEAM Awards. In this inaugural year, the 2019 Women Who STEAM Awards will recognize outstanding women in the areas of Science, Technology, Engineering, Arts and Mathematics who exemplify extraordinary contributions in their fields while also Serving, Teaching, Exceling, Aspiring and Mentoring within their workplaces and communities. The Dallas (TX) Chapter of the Links, Incorporated is committed to cultivating young female scholars, championing diversity and inclusion in STEAM fields, celebrating the contributions of women of color in STEAM fields and growing this award to inspire and ignite young girls of color to pursue careers in STEAM. 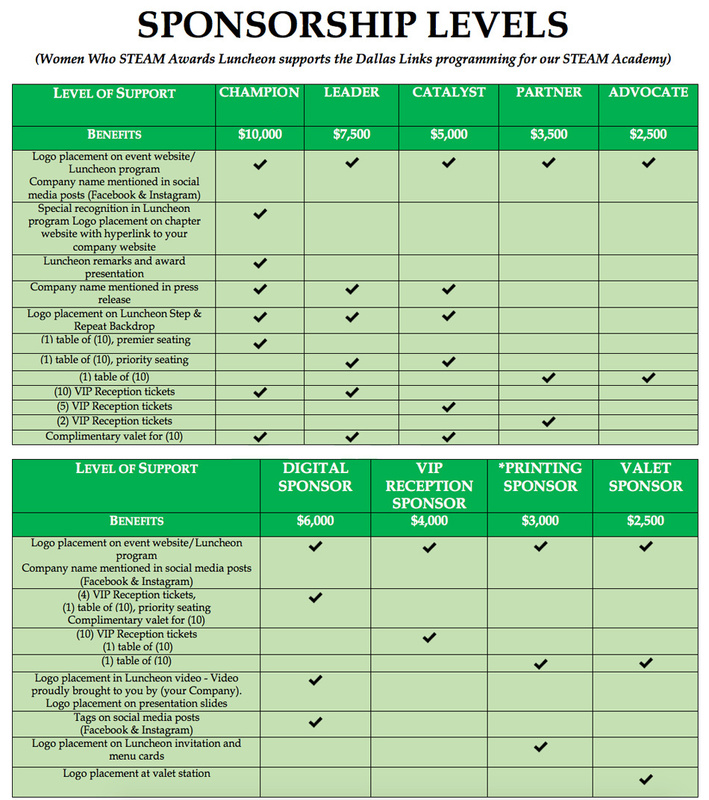 Recipients of the Women Who STEAM Award will be celebrated at the Dallas (TX) Chapter of the Links, Incorporated Women Who STEAM Awards Luncheon on Tuesday, April 30, 2019. Sponsorship tables are available now. Please contact Cheryl Mayo Williams at 214-537-5096 with any questions. A limited number of tickets will be available on April 1st by clicking the Purchase Tickets link.